The most popular newspaper comic strips of the late 20th Century featured “Monday” strips. Synopsis: the character hates Mondays. Hilarity ensues! We can all* relate, right? Here are some more Monday cartoons, and an answer to them from Dinosaur Comics. *I’ve been self-unemployed since I dropped out of college at age 19. 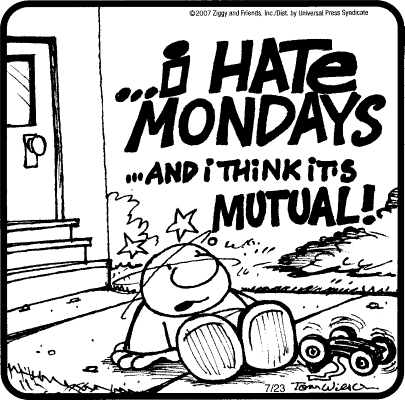 The most popular newspaper comic strips of the late 20th Century featured \"Monday\" strips. 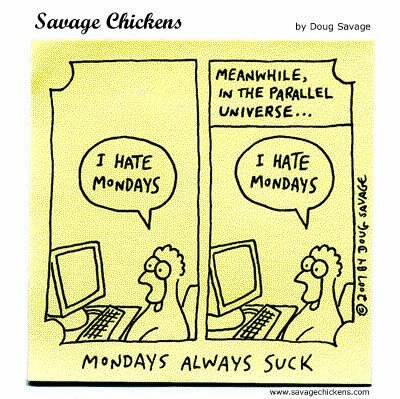 Synopsis: the character hates Mondays. Hilarity ensues! We can all* relate, right? Here are some more Monday cartoons, and an answer to them from Dinosaur Comics. *I\'ve been self-unemployed since I dropped out of college at age 19. Self-righteous helmet naggers are a much more prevalent danger to cyclists than physical injuries. There’s little evidence my helmet would increase my physical safety in case of an accident (there’s as much evidence for the opposite, in fact), but it does protect my social safety. If I suffered an accident, I’d need the support of my friends and family, and they threaten to withhold this if I don’t wear a helmet. So I do. And then I make cartoons complaining about it.